Central-nervous-system agents today constitute the fastest growing sector of the pharmaceutical market, accounting for 31% of total sales in the United States. In 2001, of the twenty-five drugs with the highest retail sales, eight were psychotropic, those treating mental health conditions. Anti-depressants had the highest retail sales ($12.5 billion) of any drug category, responsible for the largest share of the increase in overall drug spending from 2000 to 2001. Adult use of anti-depressants almost tripled from 1988 to 2000. Women and children experienced the most dramatic rise. In 1999-2000, 10 percent of women 18 and older reported taking anti-depressants in the previous month as compared with 4 percent in men. Use among children has seen a very sharp increase, especially with Ritalin used to treat attention deficit disorder. This trend is fraught with danger. Some people take the wrong medication; others get an old or contaminated batch, some a counterfeit; others take them in dangerous combinations with other prescriptions. Some drugs are addictive, others have devastating emotional and physical side effects. Every year a million people—3 to 5% of all hospital admissions—are admitted primarily because of a negative reaction to medications. The situation has become especially exacerbated by the medical profession’s propensity to dole out medication like candy for the slightest sign of depression, anxiety, or insomnia, helping make drugs like Prozac, Buspar, and Paxil as chic in the suburbs as crack is in the inner city. This has led to a virtual plague of legal drug addiction. There is now a safe and effective alternative for the treatment of anxiety, depression, and insomnia —CES (cranial electrotherapy stimulation). 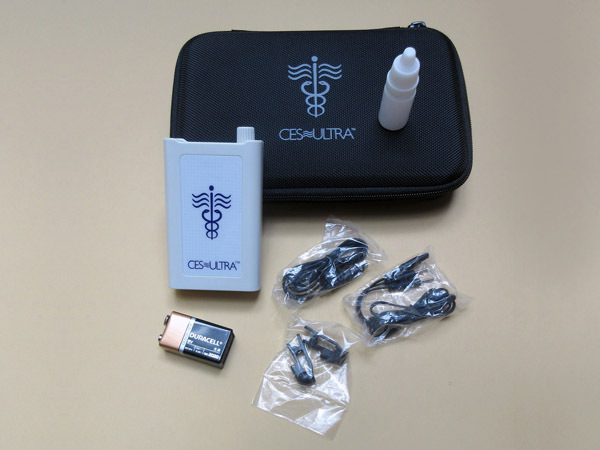 CES is the anti-drug—the non-pharmacological alternative—a unique and viable bio-electric approach which enhances the homeostasis of the biological central nervous system—the tendency for intrinsic balance within a system. User-friendly, it employs mild battery-powered electrical stimulation through clip-on electrodes attached to the earlobes or pre-gelled electrodes placed behind the ears. Current flow is limited so that the most the patient experiences during the process is nothing more than a slight tingling sensation. There are virtually no negative side effects. Gently adding energy back to all parts of the brain, CES helps return the user to the optimum state in effect before stressors were activated. CES impacts most directly by reducing anxiety. This is often experienced in the course of treatment; for others, hours, or several days after. CES leaves the patient feeling both relaxed and alert. The effect differs from pharmaceutical treatments in that people report their body as feeling lighter and more relaxed and their mind, more alert and clear. Results are cumulative and lasting. For those suffering from depression and anxiety, CES means relief with none of the unpleasant side effects of prescription drugs. For those seeking nothing more than a good night’s sleep, it is an alternative to habit-forming tranquilizers. For a public increasingly concerned with the effects of stress on physical health and emotional well being, CES provides a way of addressing that stress in a safe and effective manner. CES is a treatment modality with an ethic – that of self-regulation. Its goal, wellness—a state of proper alignment—the balanced interplay of body and mind attained through personal empowerment rather than dependency. The CES ethic believes that increased reliance on external drugs interferes with that self-regulatory process, reducing our ability to cope. That to reclaim control of our lives we have to learn how to alter that chemical composition and reorient that circuitry, not through dependency but by activating, strengthening, and effectively employing our own inner resources. CES—a treatment modality whose time has come. This entry was posted in Alternative Health on May 28, 2017 by cesadmin. Cranial electrotherapy stimulation as a treatment for anxiety in chemically dependent persons. 60 inpatient alcohol and/or polydrug abusers (mean age = 33.9) volunteered for this double-blind study. 30 were given CES, 10 sham CES, and 20 served as normal hospital routine controls. Dependent measures of anxiety were the Profile of Mood States, the IPAT Anxiety Scale, and the State Trait Anxiety Index. The CES and sham pts received 15 daily, 30 minute treatments. Based on Fisher t-tests of the means, CES treated patients showed significantly greater improvement on all anxiety measures than did either control group. There were no differences in response between older and younger patients, or between the primarily drug or alcohol abusers. No placebo effect was found on any of the measures. The authors concluded that CES is rightfully gaining increasing use in American medicine as it gains increasing confirmation as a significant treatment adjunct for stress and cognitive dysfunction in chemical dependency treatment programs, regardless of the chemical of abuse or the age range of the patients treated. No side effects were reported. This entry was posted in CES Research on May 5, 2017 by cesadmin.